The major part of Henrik Hallenborg management consists of professional trading with futures on behalf of clients, i.e. Managed Futures, on the exchanges CME, CBOT, NYMEX and COMEX, owned by CME Group, the world’s leading and most diverse derivatives marketplace. Convincing as their argumentation may seem, please keep in mind that the addition of Managed Futures to an investor’s portfolio does not necessarily mean that the portfolio will be profitable or that it will not experience substantial losses. Henrik Hallenborgs Fund Management activity also does not necessarily fit CME Groups general observations about Managed Futures Investment. 1. Diversify beyond the traditional asset classes. Managed Futures may generate returns in bull and bear markets, boasting solid long-term track records despite economic downturns. Moreover, they often do so with less volatility and smaller drawdowns than other asset classes (see chart above). Managed Futures may do well in down markets because they employ short-selling and options strategies that allow them to profi t in such markets. 7. Commodity Trading Advisors (CTAs), Pool Operators (CPOs), and Managed Futures Mutual Funds have access to a wide variety of global futures products that are liquid and transparent. 8. The CTA/CPO/Managed Futures Mutual Fund community is regulated. Trading in a regulated marketplace builds the credibility and trustworthiness of the CTA/CPO/Managed Futures Mutual Fund community. SPX/SPTR Standard & Poor’s 500 Index (SPX). An index of 505 stocks chosen for market size, liquidity and industry grouping, among other factors. The S&P 500 is designed to be a leading indicator of U.S. equities and is meant to reflect the risk/return characteristics of the large cap universe. TR – a total return index is an index that measures the performance of a group of components by assuming that all cash distributions are reinvested, in addition to tracking the components’ price movements. The Barclay CTA Index is designed to broadly represent the performance of all CTA programs in the​ BarclayHedge database that meet the inclusion requirements. To qualify for inclusion in the index, a program must have at least four years of performance history (or two years for additional programs from the same advisor). As of December 2014, the 535 programs in the index represented assets of approximately $232 billion. 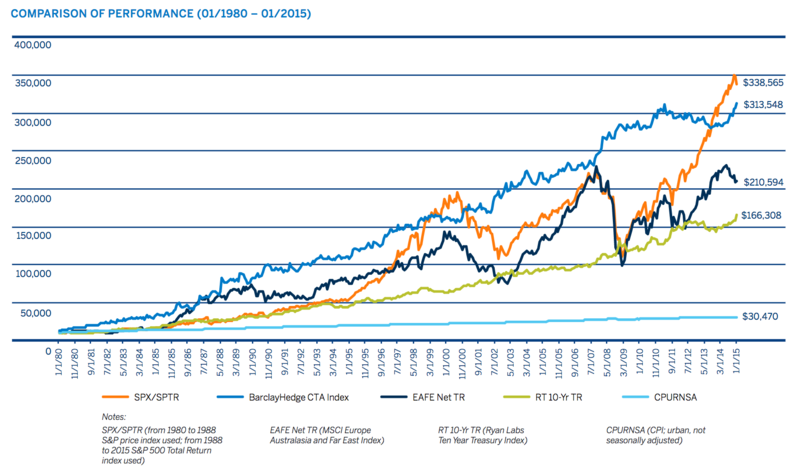 The MSCI EAFE Index is designed to represent the performance of large and mid-cap securities across 21 developed markets, including countries in Europe, Australasia and the Far East, excluding the U.S. and Canada. Ryan Labs Ten Year Treasury Index.The Treasury yield curve is the risk-free baseline that investors can use to measure the intrinsic value of any investment. The Ryan Treasury Index shown here display how interest rate changes affect returns usually in an inverse relationship (yields go down, returns go up and vice versa). The Consumer Price Index for All Urban Consumers (CPI-U), produced by the Bureau of Labor Statistics (BLS), is the most commonly used measure of inflation in the United States. A measure that examines the changes in the price of a basket of goods and services purchased by urban consumers. Data sourced from BarclayHedge, Ltd., MSCI Inc., Ryan Labs Inc., and Bloomberg, L.P.
FUTURES TRADING IS NOT SUITABLE FOR ALL INVESTORS, AND INVOLVES THE RISK OF LOSS. FUTURES ARE A LEVERAGED INVESTMENT, AND BECAUSE ONLY A PERCENTAGE OF A CONTRACT’S VALUE IS REQUIRED TO TRADE, IT IS POSSIBLE TO LOSE MORE THAN THE AMOUNT OF MONEY DEPOSITED FOR A FUTURES POSITION. THEREFORE, TRADERS SHOULD ONLY USE FUNDS THAT THEY CAN AFFORD TO LOSE WITHOUT AFFECTING THEIR LIFESTYLES. AND ONLY A PORTION OF THOSE FUNDS SHOULD BE DEVOTED TO ANY ONE TRADE BECAUSE THEY CANNOT EXPECT TO PROFIT ON EVERY TRADE.